Like a good movie or book, there came times of struggle. Joey and Rory attained fame and success. No amount of fame can protect from the storms of life, however. When Joey and Rory had a child, Indiana, she was diagnosed with Down Syndrome. Joey faced health challenges, being diagnosed with cervical cancer and ultimately losing her battle here on earth. Yet Joey knew the Heavenly Father and is no doubt healed and singing in heaven. If Joey were here, she would love both of the schools that Indiana goes to, but she would be homeschooling Indy. Not just now, but permanently. At least I believe she would. Partly because she would want our little one here at home with her, growing up and learning on our farm. And also because she would be way more interested in Indiana learning to be a good person than being a good reader. To love God and the life that He’s given her, more than what a lot of the world is telling us to love. And in her mind, home is the best place to learn those things. Before she died, however, the story goes that she pulled back a bit to make sure that Indiana bonded more with her father. Perhaps this paved the way for children’s stories such as, The Cow Said Neigh! (picture book): A Farm Story and the school that Rory Feek started at his home. You can read more about the Feeks on his blog and in his book, This Life I Live, which is a bestseller. Fortunately, this story has a tragic middle, though not the end. I love happy endings! Aside from being a bestselling author, Rory Feek also has number one-songs, grammys, and even made a film called To Joey, With Love. Now he introduces a brand, new book entitled, The Cow Said Neigh: A Farm Story. The Cow Said Neigh! (picture book): A Farm Story is a sweet story, perfect for preschoolers or beginning readers. During the story, several farm animals compare themselves to others and dream of what life would be like as another animal. I was expecting the typical ending, that they would all find out somehow that it was best to be themselves. Instead, however, we were left with the farmer joining in and mooing in the end. Some might initially find the ending unsettling, but it is actually refreshingly honest. After all, don’t many of us enjoy dressing up and pretending to be someone else once a year? Even if not, who doesn’t enjoy fantasizing about what it would be like to be someone else? It’s that kind of creativity and imagination that helps us empathize with others and encourages us to strive for our best. Check out The Cow Said Neigh! 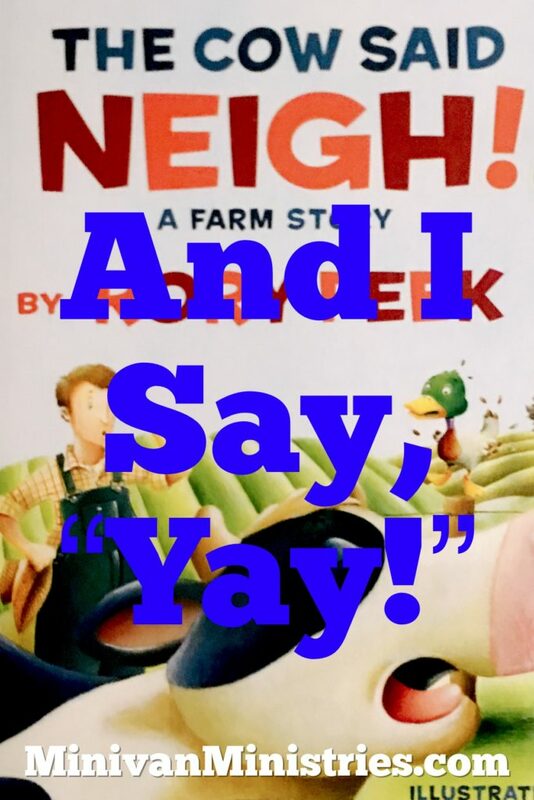 (picture book): A Farm Story today. Go here to win a copy! If your kids are like mine, you are also going to want to go here and get some free coloring pages. I gave this book to my grandson,well read it 1st. I love watching him be a daddy. Juana Noris recently posted…How Many Teeth Do Horses Have?